Brendan Davies is one of the those runners who just can’t stop running. 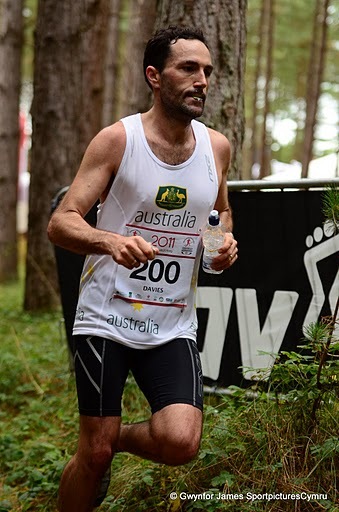 At the drop of a hat he will turn up for a training run, race at his local Running Wild Series, compete with his No Roads Trail Team and represent Australia which he takes all in his stride. On a recent training run through his local Blue Mountains I caught up with Brendan and was lucky to get his views on the state of Australian ultra running, his plans for the rest of the year and his views on Kilian. All eyes will be on Brendan at this weekends Six Foot Track Marathon where he hopes to go one better this year as long as the weather gods are kind to us. What is your running background ? Were you a good runner at School? I always looked forward to the cross country and athletics carnivals at school, I got through to regional level a few times but it was done off no real specific running training. When I was a child I was more into playing lots of team sports like football, cricket and soccer. I did little athletics too which was more for the social benefits of being around (girl) friends than anything else. During late high school I’d keep fit by running around the streets but never really raced except doing the City 2 Surf and the odd fun run here and there that I’d stumble across. In my 20s life took over a bit and health and fitness definitely took a back seat to socialising and then later on, establishing my career. In my late 20s I decided to ‘change my ways’ so to speak and started playing squash competitively and actually went back to running to try and get some more fitness for squash. But the seed was sown, running took over and I haven’t looked back. What is your primary motivation ? That’s an easy one – pleasure! I enjoy every aspect of the sport; feeling fit, the rush you get from the run, goal setting and goal achievement and the social aspects that go with being in and around the running community. What is your preferred distance and surface? I love racing all distances from flat out track races to ultra marathons and everything in between. Trails are my favourite surface although I also enjoy the speed and rhythm you get into on the road. About the only surface I don’t really like are stairs or really technical ascents were walking is necessary. Your best achievement to date ? I think my 4th place at the Commonwealth Ultra Trail Champs in Wales was the best I’ve ever raced, things pretty much went to plan. There were a few small areas in preparation and even during the race which probably cost me a podium place but in hind sight it’s easy to be self critical! I was very pleased with the 5th place at the TNF100 but finished that race thinking there was a lot more improvement in that race to come. Just have to run more of Kedumba instead of walking! What does if feel like to represent your country? It is an honour but also satisfaction for a lot of hard work. It makes you knuckle down and be disciplined and achieve those little 1 percenters that could make a difference. I always feel very grateful too as my work and family life allows me the opportunity to do these runs. There are much better runners out there than me, but for various reasons can’t always take up the opportunities. How do you think the Aussies are perceived as an ultra running nation by our overseas competitors? I don’t think we would be perceived too differently to other runners turning up to an event overseas. The international running community is one big family and when you travel you quickly realise that running is truly a global sport. At the bigger events with qualification criteria, we would be seen as potential dark horses. With athletes like Martin Fryer, Andrew Vize, Beth Cardelli and others finishing high up in the big events overseas, we are definitely being noticed more and more. Can you describe a typical training week when building up to an A race? Sunday – Long run of 25 – 40km depending on where I am at in my build up. Usual mileage is around 110 – 130km a week. How much emphasis do you place on your recovery ? The older I get, the more and more I am finding out how important spending some quality time post run in recovery mode is. I’ve always been a prolific racer and I never really fully recover before the next race, but I try to speed up the recovery process by eating, stretching, cold bathing straight after a heavy training session. What sort of nutrition strategy do you use for your longer ultras? I’ve never given much thought to the ‘on the run’ nutrition aspect as I’ve never really had to; I’ve only run up to 100K and I’d say my nutrition plan was simple at best; I usually just get by on gels and electrolyte. Leading up to a big race I am a follower of carb depletion/carb loading strategy. In the week leading up, I’ll eat very light protein rich food for 3 days followed by 2-3 days of eating complex carb food at every meal. I think the depletion phase gives more a psychological benefit than anything else. It helps maintain a good racing weight and I feel ready to load up in the next 2-3 days. On the morning of a big race I’ll get up 4 hours before the race and have a bowl of porridge with lots of honey and a cup of strong coffee. 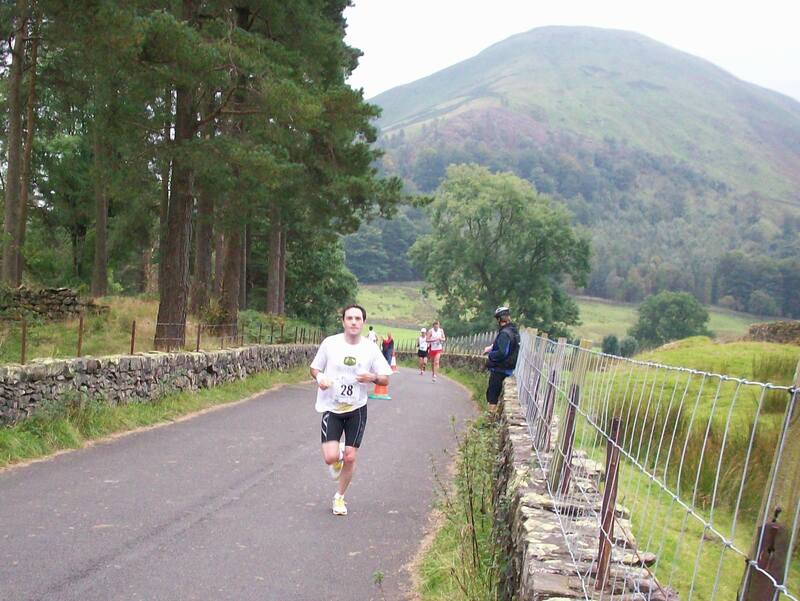 Were you surprised with the speed of the 100 milers at GNW100 ? Very much so! Every preconception of the milers went right out the window on the first leg of GNW as they flew past me through the taxing rainforest section! I actually thought they were just a couple of local guys on a training run, and then I saw their different coloured race numbers and realised these guys were the milers! That spurred me into shifting up a gear for sure. Even at the finish, the top guys like Vizey and Matt Cooper came in not long after I had finished and that blew me away too. I was an absolute spent force and here they were powering off into the distance. Will we see you have a crack at a 100 miler in 2012 ? Maybe, I’d like to step up to this new challenge. It’s going to be a huge year of racing, with many ultras and if I still have the legs in my at the end of year it will be at the GNW100. You have been selected for the Aussie 100km team- how do you see your chances against the rest of the world ? I’m treating this event with the utmost of respect, it is not very often you get to race in a truly international event. Along with Comrades, it is the pinnacle of road ultras containing the elite of that distance and it is comforting to know that most athletes are still amateur athletes. Racing wise, the hardest thing in road ultras is holding yourself back in the early stages, not burning up fuel unnecessarily. To a certain extent trail ultras can be ‘easier’ as the terrain often dictates the pace. On the road, it’s a different ball game and running at the unusual race pace of 4:30 minute ks can be the hardest thing. If you get the pace wrong early and you’re gone by 50ks, it’s a long, slow way to the finish! If I can get my pacing right, I think I can get my aim of 7:15 which should put me up there. Overall, the Italians, Japanese and US runners seem to be in a league of their own and will fight it out for the top spots. What ultra runners do you admire ? I admire all ultra runners, it takes such dedication, sacrifice, and organisation to train, prepare and race ultras. But if I was to pick out some, it would be the versatile runners that take on anything and everything from 5K track all the way up to the long trail ultras. This versatility is something I’ve aimed for throughout my running career. I have a lot of admiration for guys like Dave Criniti and Tim Cochrane because of this. What is you most trusted piece of equipment/gear ? The longer the race, the more important the gear becomes and nothing could be more important to a runner than the shoes you wear. On the trails, my most trusted shoe is the inov-8 212s. They have never let me down and have been on my feet in all my major trail racing and ultra highlights. What sort of shoes do you use for the various surfaces you run on ? Inov-8 range of trail shoes for trail events, the model depends on the length and the terrain of the course. On a flattish, firetrail course I’ll usually go with the f-lite 195s. If there is any hint of water, mud, steep ups and downs or technical trail i’ll go with the X-Talon 212s or 190s. I love the lower profile of the inov-8s. They give a more natural centre of gravity and great stability on unstable terrain. On the road, I have a range of shoes again. At the moment I’m wearing inov-8 Terrafly 303 for training and the Bare-s lite 135s for racing flats. Tell us more about your Barefoot Inc relationship ? I’ve always believed in the benefits of running in minimalist shoes, whether on the road or trail, and I’ve had very few injuries in my career so I stick with what works! I’ve always pretty much worn inov-8 on the trails and they are the distributor for these great shoes in Sydney. I get to trial and give feedback on a lot of sample products they get, being a size 8 is very handy; it’s the sample size they get sent! I have recently started trialling some other great products too like the ultAspire hydration packs. For ultra runners it is like a ‘one stop shop’ for all your needs. 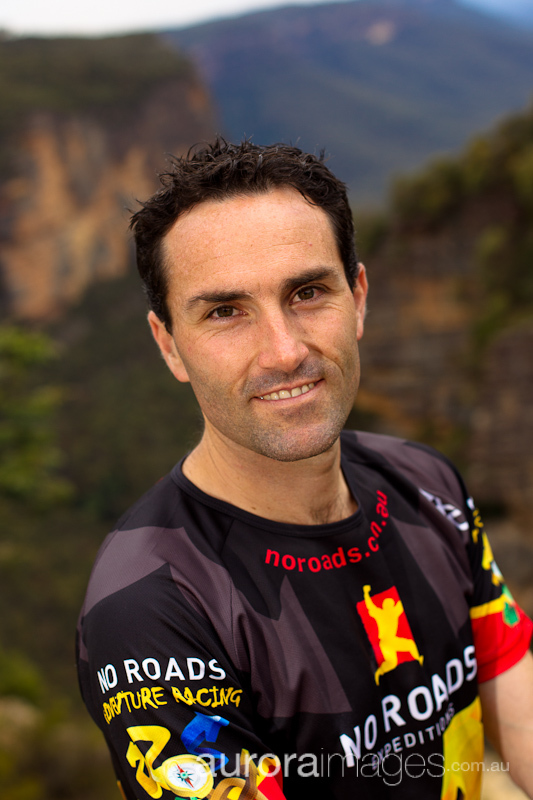 You are part of the No Roads Trail Team, what is it like being in a team of elite competitors ? It’s great being part of a team, it brings out the best in us all and gives us great opportunities to travel around and enter events that we otherwise may not do. In the team events, it’s a nice change not to be racing these guys but running with them for a change! Who is the most versatile runner amongst you ? I would probably say UE (Ewan Horsburgh). He runs road or trail, from short to long and does it really well! His PBs for some of the shorter distances are fantastic and we all know about his recent triumph at Coast to Kosi. If it came down to the final km of an ultra who out of the team would you least like to be sprinting against ? Mick Donges in his younger days was a state sprinter with an 11 second 100 metre to his name so it would have to be him, but to be honest I don’t think I’d have a hope in hell against any of them! What races are you targeting in 2012? The A races this year are 6 Foot Track (subject to the weather), then the World 100k Champs followed by TNF100. After that I’m going to concentrate on getting my road marathon time down, it could be the last chance I have of breaking 2:30. I’m not sure which marathon I’ll target yet. The Kokoda Challenge with No Roads will also be a key race. Then if all goes well GNW 100 miler. What races are No Roads targeting in 2012 ? Having 6 men and 2 women on board now gives us some flexibility with different events. 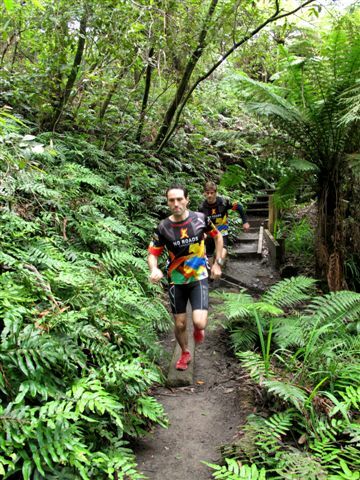 We want to defend our Kokoda Challenge title and also take out the Sydney Trailwalker and TNF100 relay. There are teams categories in non-team events too, like 6 Foot Track and Woodford 2 Glenbrook that we want to take out. Another exciting prospect is a one off event that No Roads Expeditions are planning on the Kokoda Track in PNG. It will be a head to head of No Roads vs the best of the Kokoda porters including the current course record holder Brendan Buka. This is still in the initial stages but stay tuned for this! How do you think your colleague Clarke McClymont will go at UTMB ? Clarke definitely has the potential to deliver. This type of race with its constant climbing and descending over rough terrain plays into his strengths like no other runner I know. He is a fantastic climber, and the steeper and rougher it is the better. I’ve trained with him a lot, and once he breaks out those walking poles, there is no stopping him. 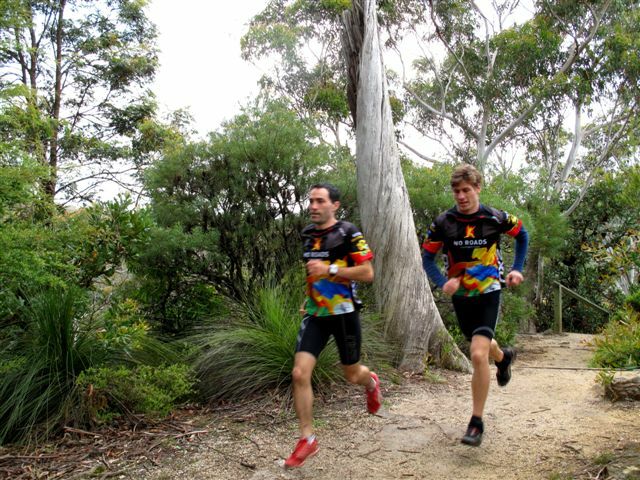 As an example, recently we ran the Blue Gum Forest to Perrys Lookout track, some 350m of climbing over 2.2km. We ran together about 2/3 of the way where we both started walking the steep, irregular stair section. In the next third he put 2 minutes on me to the top. He is also very nimble and agile on the tough descents. I know he is treating this race with the utmost respect and he is going to train the house down. If all goes to plan I think we could see an him go very deep in the top 10. What advice would you give to someone wanting to take up an ultra ? Don’t make things too complicated by getting bogged down in gear choices, pacing splits or complex nutritional plans. Keep it simple and enjoy the ride! Oh, and read www.ultra168.com! What is your marathon PB ? What sort of time are you targeting for the worlds ? Under 7:15 would be very satisfying. My PB is 7:31 and this was before I was even running regular ultras. I think I know a lot more about racing ultras now so it should be achievable. If a couple of things go in my favour then I could get near 7h. The course is flat enough for this to happen. It has an ideal layout with it being 5 x 20k loops, it’s easy to break up the race into 5 parts. Will you change your training to focus on this race ? Yes, once I was selected I made a decision immediately to do most of my training on the road instead of the trails as I tend to do up here at Woodford. I have already found that my road running rhythm, technique and economy has come back. 100k on road is all about rhythm and economy, while trail running tends to be more about technical skill and strength. I’ll also be looking to trim down to more a road runners physique too. What is your dream race ? When I was in America in 2010 I went to the Grand Canyon and ran down the Kaibob trail to the Colorado River and returned via the Bright Angel trail. A brutal but breathtakingly beautiful run. If that was a race I’d be on the plane tomorrow! 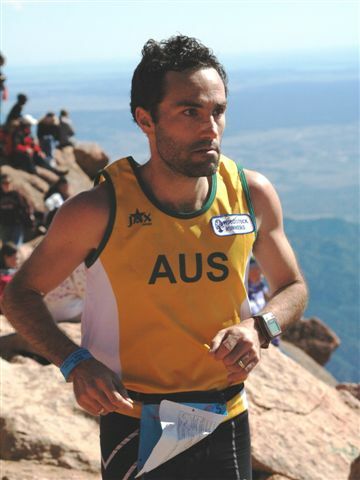 Who do you think will win between Kilian and Carpenter at this years Pike Peak? It’s the battle of the year this race! The old hand Matt Carpenter against the young gun Kilian. I have so much respect for Carpenter for what he has done over his extensive career at Pikes Peak and my heart says Matt but my head says Kilian. But wouldn’t it be great if the 48 year old beat the young gun! Will you return to PP ? What was that experience like ? I would love to but the reality is that there are that many other races overseas that I would love to do as well. It was a great experience, and also humbling to be among the World’s best mountain runners. Colorado has such a great running community and their race organisation is second to none. Running in real mountains was an experience I’ll never forget. Although I didn’t have a great race there, it is a memory I will always fondly remember. Who is an athlete to watch in 2012/13 ? I think we’ll see some great runs by Aussies overseas. 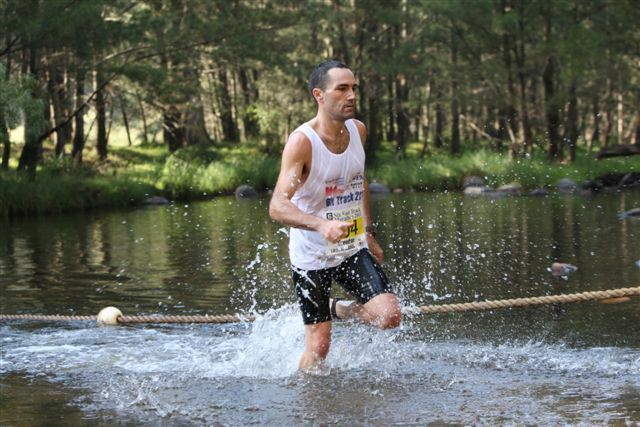 Mick Donges is going to have a huge year starting with a great run at Terawera Ultra in NZ. He has the potential to be world class and I hope he does very well. He would be a great ambassador for Australia on the International Salomon team! Ryan Sandes is a more mature runner this year and will definitely be better for his run on the course last year. Winning Leadville has got to give him deserved favouritism and I think he will deliver. Saying that though, there are so many great Australian runners that have the ability to put it to him. Who are your rivals for Six Foot ? I haven’t really looked at the entrants list but obviously all the usual suspects – Andy Lee, Andrew Tuckey, Tim Cochrane, Alex Mathews, Ben Artup, Tony Fattorini. It’s a very strong field again. I’ll be happy with a PB this year and whatever place that lands me I have to be happy with. Do you think Anna Frost can podium out right ? Brendan is pure class, a good bloke and very humble. Would love to see him take out 6ft this saturday. It’d be well deserved. Great interview from a great guy and a fabulous runner. We, at Woodstock Runners, continue to be inspired by Brendan. Good luck on Saturday, Bren and of course, in the Worlds as well. Good luck to you this weekend, Brendan. You’ve been an inspiration to many of us- even those who are not as fast and who cannot run as far…..you’ve made us realise we are all capable of a lot more than we sometimes think. Woodstock Runners has become a much better place, having been touched by your presence. Good interview! Hope you don’t mind me stealing and quoting you Bren 🙂 As a Woodie and a friend so proud of you! Good work buddy…. Good luck this Sat and in Italy, you’ll smash it! You didn’t mention that i taught you everything you know?! Great article. Well done to the interviewer and to Brendan. Brendan comes across as the wonderful but humble runner that he is and the interviewer captures that perfectly. Great article on a great bloke! Brendan has come along way in the last 5 years…keep it up mate! Great Interview. Brendan is a top quality Australian runner, great to see his desire to remain versitile while keeping it simple.